Configuration can be done either through the /appliance interface or through the virtual machine console. For the second option, please see Virtual Machine Console Administration. From the /appliance interface of your BeyondTrust Virtual Appliance, log in using admin as the username and password as the default password. You will be prompted to change your password the first time you log in. Next, go to Networking > IP Configuration. 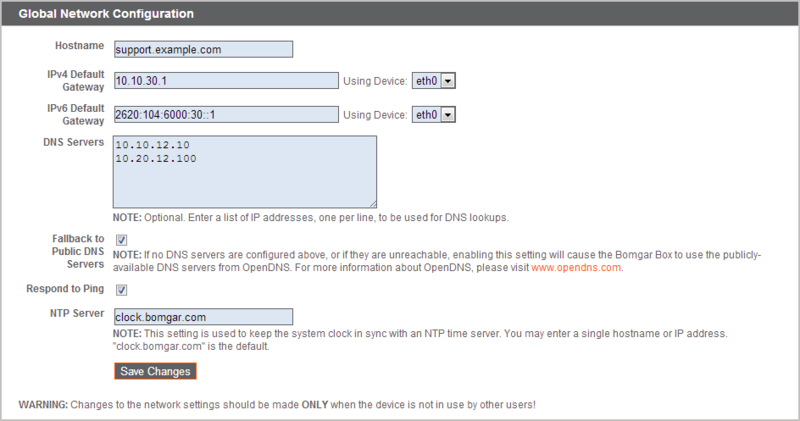 Under the NIC Configuration section, click Add New IP. Enter the static IP address and subnet mask for your Secure Remote Access Appliance. You can decide if this IP address will allow session traffic, web traffic, or both. Then click Save Changes. Under the Global Network Configuration section, set your default gateway. Configuring DNS servers is not required but is highly recommended. After entering the required information, click Save Changes. Valid DNS settings are required for failover and automatic updates to function properly. To help determine the appropriate IP and DNS configuration for your network, see The Secure Remote Access Appliance in the Network. Go to Storage > Status and click Format this Disk for use by the appliance. Wait for the format to complete, and then go to Status > Health to verify that the needs of the Virtual Appliance are being met. For more information, View BeyondTrust Virtual Appliance Health. For additional information about configuring your network, please see the Secure Remote Access Appliance Web Interface.